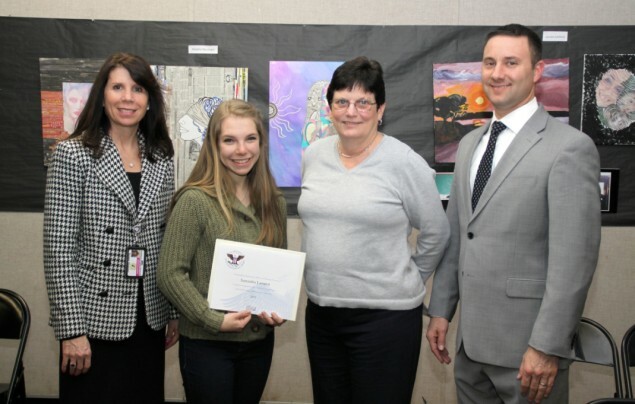 Samantha Lampert, a senior at Commack High School, has been honored for her exemplary volunteer service with a President’s Volunteer Service Award. The award recognizes Americans of all ages who have volunteered significant amounts of their time to serve their communities and their country. Samantha was nominated last year for the Prudential Spirit of Community Award, and advanced to the State finals. Volunteer activities were judged on criteria including personal initiative, creativity, effort, impact, and personal growth. The President’s award is given on behalf of President Obama through Prudential Financial. Finding joy in helping others, Samantha is a member of the Pay it Forward Club, volunteers at a local animal shelter, and has volunteered at Relay for Life, Special Olympics, and as a teen leader on Challenge Day. Photo above: Samantha with Commack High School Assistant Principal, Susan Shapiro, Guidance Counselor, Christine Natali, and Director of Guidance, Jonathan Macaluso.